There are places throughout our communities that engage us as people in things outside of ourselves that are larger than ourselves. And then there are other things people do that deeply engage us within ourselves. In a popular culture that seems to pull us into those extremes constantly without attention to balancing our interests, it can be important to acknowledge that there are different positions for different activities throughout our lives. 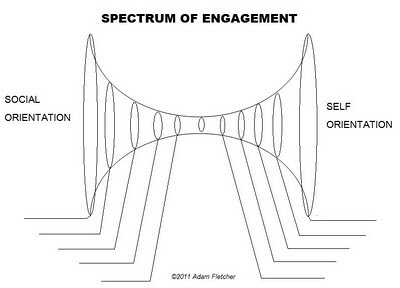 Different types of engagement activities affect different people in different ways. The broadest measurement for success in engaging people is how closely they fit a given definition of engagement. I have defined engagement as emotional or psychological connection a person feels with a thing outside of themselves. 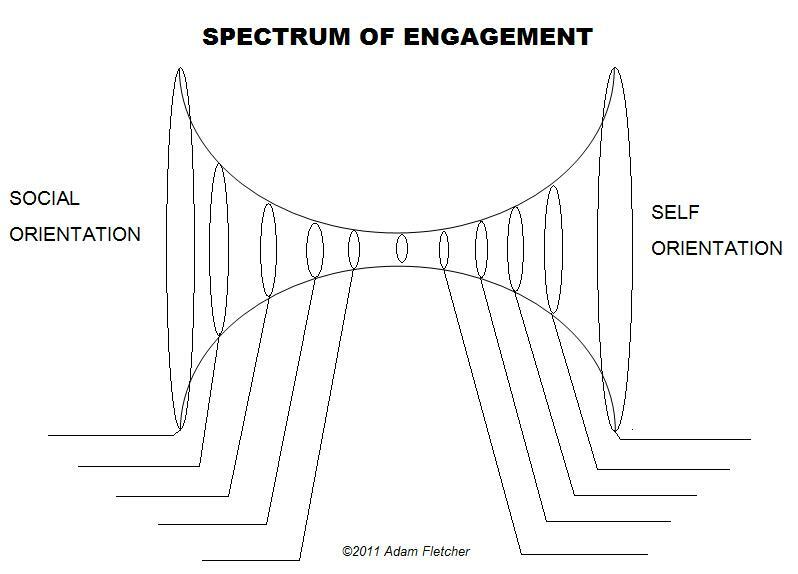 This definition makes no value judgment about different perspectives and outcomes of engagement; instead, it positions engagement as a non-linear phenomenon both within and outside of an individual. For the purpose of measuring the efficacy of an activity in relationship to this definition, participants identify a variety of activities that engage people within themselves and in their own lives, and activities that engage people outside of themselves and throughout their whole communities. Activities that may engage a person within themselves could include exercise, listening to music, studying, meditation, and reading. Activities that may engage a person throughout their larger world include reading the newspaper, eating dinner with your family, volunteering at an animal shelter, sitting on a nonprofit board of directors, volunteering for a play, and so forth. Being as specific as possible is useful. When completed, participants should have a wide array of activities represented on their Spectrum of Engagement, acknowledging the depth and breadth of engagement activities that are happening throughout a given community. Over at Wikipedia there’s a debate flaring over the article on adultism. Two trains of thought occur in this debate: one regarding the validity of the article and whether there are enough reliable sources in the article to make it a legitimate Wikipedia article; the second focused on the validity of adultism as a topic to be addressed on Wikipedia. Both arguments are worthy debate. However, I find a recurring pattern of discrimination present in the former argument: There are those who firmly believe that adultism should be presented with a neutral definition that does not portray an inherently negative basis. Note that this is different from the treatment racism or hetrosexism receives on Wikipedia, as both of those are presented in their biased forms. In coming out in favor of a neutral definition of adultism editors will often expose their bias towards adults. As one editor redefined the term, “Adultism the the belief that adults should have inordinate power over children”, and “Adultism is the act of exerting inordinate control over children by adults”. I believe that these very definitions, by nature of their phrasing, demands the reader to accept this “inordinate control”. Reviving my knowledge of the current literature surrounding adultism, I searched across the research databases to find out how adultism has been defined recently. Following is a collection of definitions from throughout the neutral, scholary realm of academic journals and books. “…negative construction of the meaning of youth is a form of oppression, referred to as either ageism or ‘adultism’.” – C.A. MacNeil, “Bridging generations: Applying “adult” leadership theories to youth leadership development”, in ”New Directions for Youth Development” (2006). “Adultism… can be defined as the inherent belief that adults are ultimate experts on youth, their issues, dreams, anxieties, abilities, and health; adults are thus thrust into positions of ultimate decision-makers and arbiters of policies, programs, and services involving youth.” – M. Delgado and D. Zhao, ”Youth-led health promotion in urban communities: A community capacity-enhancement perspective”. Rowman & Littlefield (2008). “…an antiyouth bias sometimes called ‘adultism’…” – D. Hosang., “Family and community as the cornerstone of civic engagement: Immigrant and youth organizing in the southwest” in ”National Civic Review” (2006). “If we define abuse as restricting, controlling, humiliating, or hurting another, it’s clear that abuse is a daily experience for young people. We have a new word for it: adultism.” C. Close, “Fostering youth leadership: students train students and adults in conflict resolution” in ”Theory into Practice” (2007). These definitions show a clear patterning of negative perspectives in the defining of adultism. However, given the apparently predominant perspective of at least one Wikipedia editor, Wikipedia will soon feature a supposedly neutral definition. Reviewing the definitions I have previously used in the Wikipedia article, I found this an active trending towards exposing the discriminatory basis of adultism by authors from across the realms. However, many of the following sources are questionable to Wikipedia editors who find them to be from “advocacy organizations” or authors with dubious bases for their assertions about adultism. (I personally find that perspective discriminatory, as it alienates perspectives, but for the sake of process I’ll accept it.) Following are some of those definitions. “[Adultism is] behaviors and attitudes based on the assumptions that adults are better than young people, and entitled to act upon young people without agreement.” J. Bell (1995) “Understanding Adultism” on the YouthBuild USA website. “Oppression of Young People (from the day they are born), based on their age, by care givers (who are used as the oppression agents) and by the society and its institutions.” – Co-counseling. “Adultism is an adult practice of forming certain beliefs about young people and practicing certain behaviors toward them because of societal views, usually negative, that are based on their age.” – Child Welfare League of America. “Addressing adultist behavior by calling it ageism is discrimination against youth in itself.” – Youth On Board. It is interesting to see how the tides of discrimination vary, washing back and forth over the bones of justice. We should take a close examination of our own biases before calling out others’, and afterwards revisit this conversation with a thorough acceptance of our own perspectives. Posted byAdam September 4 Posted inadultism, identity, perceptions, Wikipedia, youth1 Comment on In Favor of Adultism? A person studying the Sunday morning comics for adultism and forms of anti-youth discrimination could die a thousand deaths from over-exposure. Somewhere between “For Better or For Worse” and “Sally Forth” it’s laid on heavy. Even my childhood favorite Garfield gets in on it on occasion. That’s why today’s “Family Circus” is a little relieving. For all the slanderous things artist Bil Keane ever writes that grossly oversimplifies, patronizes and offends youth, today’s strip helps pull back the curtain on adult hypocrisy in a really soft, easy-to-digest way. It’s made of a large dimmed blue panel with images of the kids devouring their Easter finds, and goodies scattered around the panel. In the center is a bright, full color circle with an image of the family’s holiday dinner table, packed with a bountiful Easter meal. But here the kids are all slumped over and lethargic, and the father is wagging his finger at them for not eating their dinner. By pointing out the failures of many traditional American parents, artist Keane acknowledges the discriminatory practice inherent in much parenting practice. We’re a hypocritical bunch who often feel like we’re crawling around on our hands and knees in the dark looking for a clue to do this “right”. Thanks Bil Keane for giving us a little tool to help find our way. I forgot to mention that these last two days I’ve been at the Washington Prevention Summit. The Summit, held annually for a long time, is a gathering of youth and adults who participate in alcohol and other drug prevention activities across the state. There is a hodgepodge of communities represented among the 700 participants here, including urban, rural, suburban and exurban youth who are hispanic, American Indian, black and white, with the wide majority of them being low and middle income youth. These are the “anti-” groups, standing against so mny things with built on largely prejudicial and biased data analyses * * *, dated slogans, utterly hip marketing campaigns *, and fun, well-meaning but hollow and ineffectual activities. Ah, such its so nice to attend a good conference every now and then. In the name of transparency, let me be forthright and tell you that I’ve participated and facilitated these activities before. This is what 19 years of youth work has given me: the perspective to be able to say that, indeed, I’ve done wrong by young people. I’ve messed up. Alas, here I am to publicly genuflect, make sincere amends and propose a new way forward. My earlier post is one way. Another is the eight years I’ve spent advocating specifically for youth engagement throughout society, including schools. I have even keynoted at this very conference, where last year I keynoted [pdf] on meaningful youth involvement. That’s why I’m excited that this year there are a variety of workshops that span a range of issues that matter to me, and that I think may change the face of this field. “How to work with those pesky adults,” “Using media to work with youth,” and my “Make it meaningful” workshop stand next to more traditional topics like, “Kickin’ ash,” “Marijuana truths,” and “Destination graduation.” I won’t claim this as a 100% success – but its hard not to see it as a step forward. This is post 2 of 5 exploring popular perceptions of young people today. Marketers have spent more than a half century trying to convince consumers to buy the image of youth being a perfect time, filled with frivolity and carelessness. Literature portrays an idyllic time of life that is airy, unassuming and light. Pop music suggests that between mood swings youth have little room left for the concerns of adulthood. As for childhood, these same elements perpetuate a further mythology, reinforcing the traditional conception of children as simplistic minions, empty vessels awaiting the knowledge of adulthood and eagerly assuming whatever mantle is given them by the adults around them, whether that of son or daughter, student or client – or all together, at the same time. Adults are taught to envy this existence. In modern America this first took the form of cherish, in a Victorian era when middle class children were placed on pedestals for their preciousness and perfection. During that same period youth were married off or sent to their professions when they were young. Working class boys became apprentices to laborers, craftsmen and farmers while poor children were sent to the fields, factories and mines. In the ensuing 100 years youth were alternately viewed as powerful (1930s); suspicious (1950s); despised (1960s); lazy (1970s and 80s); dangerous (1990s), and; overachieving (2000s). All of these attitudes are then marketed back to adults as something to actually want: In the 1940s adults were sold the power of their youth; the so-called laziness of the 1970s was used as a counter-image for adults to rebel against in the 1980s, driving them to become more even more driven, more capitalistic. This says nothing of today, when adults are busy buying HDTVs and widgets for their cars in order to compensate for our inadequate knowledge of technology in the face of the Digital Natives of today. None of this says anything of the political concerns of youth today, living in a world where they are systematically denied the right to freedom, participation or democratic representation. But that’s another conversation for a different day. This post is simply meant to expose another popular perspective towards children and youth, which is young people as enviable. This is post 1 of 5 exploring popular perceptions of young people today. Over the next few blog entries I’m going to write about what the common motivations are for engaging children and youth. Today I start with seeing young people as inevitable. There’s this idea out there that somehow young people are inevitable and that’s why we’ve got to listen to them. Everybody was a young person, lots of people are going to make young people, everybody needs to listen to young people. The problems with this perspective starts with the assumption that young people are just an extension of adults. By sourcing our understanding of children and youth within ourselves, we disassociate ourselves from what is different in them, making it okay to deny who they are in order to make them just like us. This downplays the racial, cultural, social, religious, economic, and other differences between young people and the adults who work with them. Then, in order to continue to work with the people who are different then us, adults come to see children and youth as sources of entertainment. It becomes okay to mimic the African American youth who hang around the gym after school; it becomes okay to laugh behind the back of a youth who flubs up word usage during a meeting. In the same way, seeing young people as inevitable makes it okay to reduce their role in society to that of income generator, as demonstrated by the entire field of youth marketing. In this capacity there are dozens of businesses that profiteer from treating youth as a simplistic time of life in which the desires and dreams of an entire market segment can be distilled into sound bites and visuals that appeal to the mass market that was created for distribution. This may be the most cynical and pervasive view of youth today, as countless schools, nonprofits and foundations have adopted businesses’ perspective of youth as consumers, and outcomes as the “bottom line” in their production operations. Its a pretty demeaning reality youth face today. There are lots of other ways that young people are viewed, to be sure, and I will explore those more in my coming blog entries. I just wanted to open the door with this view, which I fear is most common.